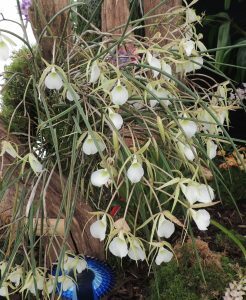 Our wonderful Brassavola tuberculata (above) has been awarded UK Orchid of the Year by the RHS Orchid Committee. The committee considers all the plants awarded during a calendar year and identifies the plant showing the finest culture they have seen. Brassavola tuberculata grows in our Warm Americas section where it is looked after by Issy Buckle, and Issy will receive the trophy at the RHS Spring Launch and Orchid Show later this month. The plant was submitted for award at the Three Counties Show last June and was in peak condition with eighty fresh very fresh and beautiful flowers.